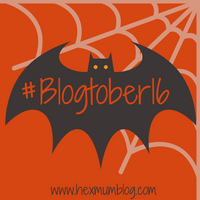 Today’s blogtober post is all about your favourite animal. My favourite animal is the elephant because I have always associated elephants with Harrison and they have always been his sort of theme animal. My baby shower was elephant themed, his Christening invite had elephants on and his Christening cake had an elephant cake topper and he has lots of elephants in his bedroom. But my actual favourite animal is our cat Darcey so I thought I would take this opportunity to introduce her properly. Darcey is a 5 year old, short haired black and white cat. She is black all over her body apart from under her chin, patches on her belly and her feet. She also has one black toe on one foot which according to her vet, is very unusual! She was somewhat of an impulse addition to my family as she was bought on the spur of the moment whilst living in student accommodation that was infested with mice. She then lived in student accommodation, enduring many a house party with drunken humans until after I graduated. Lots of people thought I was crazy getting a cat at that stage of my life (many jokes where made about how I would turn into a ‘crazy cat lady’ as I was single at the time. Fast forward 5 years and she is a much loved family pet. Harrison is obsessed with her. He constantly walks around calling for her, he tries to make that noise that everyone naturally makes to call a cat by clicking his tongue. He gets so excited when she comes downstairs but is always very gentle with her, stroking and kissing her. She isn’t so keen on him but does happily tolerate him and has struck out at him but she does hang out upstairs out of his way much of the time and then comes down to hang out with Fabio and I when Harrison has already gone to bed. She really is the perfect family pet, comes for cuddles and love but pretty much looks after herself not adding to my busy load already. Best impulse pet ever!